Ocean turbulence is a key component in understanding climate change and the challenges of harnessing tidal energy. In 2013 RSI added three employees and signed a strategic partnership with Partrac for tidal energy services in Europe. Rockland Scientific continues growth as the foremost expert, innovator and supplier of turbulence measurement instrumentation. Rockland Scientific offers a wide range of turbulence measurement systems for operation in the upper ocean and down to 6000 m. The product lineup falls into three major categories: vertical profiling instruments; modular sensor packages for deployments on AUV, gliders and other autonomous platforms; and customized measurement solutions for science, engineering, and security applications. The vertical profilers come in a variety of sizes that can be deployed in a range of environments, from lakes and coastal zones to deep ocean areas. 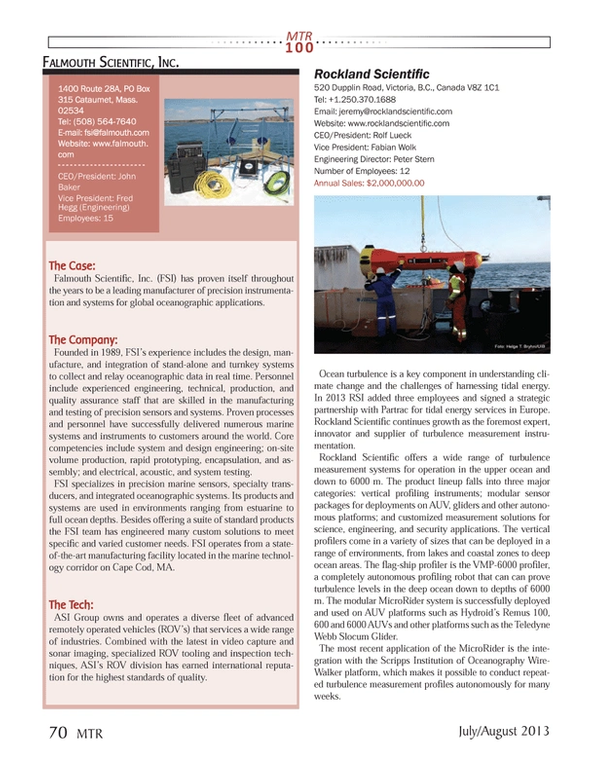 The flag-ship profiler is the VMP-6000 profiler, a completely autonomous profiling robot that can can prove turbulence levels in the deep ocean down to depths of 6000 m. The modular MicroRider system is successfully deployed and used on AUV platforms such as Hydroid’s Remus 100, 600 and 6000 AUVs and other platforms such as the Teledyne Webb Slocum Glider. The most recent application of the MicroRider is the integration with the Scripps Institution of Oceanography WireWalker platform, which makes it possible to conduct repeated turbulence measurement profiles autonomously for many weeks.